Born and raised in New York, Christianna had spent much of her early life as a stage actor, with a strong interest in the human condition. As she began to amass a body of stage credits, her fascination with human nature continued to grow, influencing her work as a performer, and leading her to study psychology at the graduate level. After completing her Masters’ Degree in Psychology with a focus on criminal sociopathy, Christianna continued to pursue a career in film. While working with professionals on network television shows and feature films as an actor, Christianna’s attention became drawn towards the art of filmmaking. In 2011, she wrote and directed her first short, To Live and Try in LA, shot on 16mm. In 2014, Christianna wrote, directed and produced her second short film, Darryl, which premiered at the GI Film Festival in 2016 and has won awards for Best Female Director and Best International Drama. In September 2018, she directed the season finale of the web series, Grow the F*ck Up starring Courtney Sauls and Samantha Smart (Dear White People-TV). 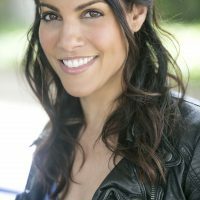 Ms Carmine's fourth directing venture, Solstice Ranch premiered at LA Shorts Fest 2018 and garnered her a Best Director win in February 2019 at the Oregon Shorts Film Festival.